Admittedly, during New England winters that can last for about 5/12 months, it takes skill, creativity, and willpower to avoid the prevalent desire to swaddle in a blanket (or anything blanket-like) and call it a day. I’m sharing how this style hack got me to try a new style – the faux leather tight – in winter, and love it! I return to the same basics in winter than in any other season because although the mathematical combinations of outfits are plentiful, the variety is not proportional to the degree of possible warmth (and importantly, the ability to raise my arms, walk around, etc under several layers, oh – and not look ridiculous or 15 pounds heavier). 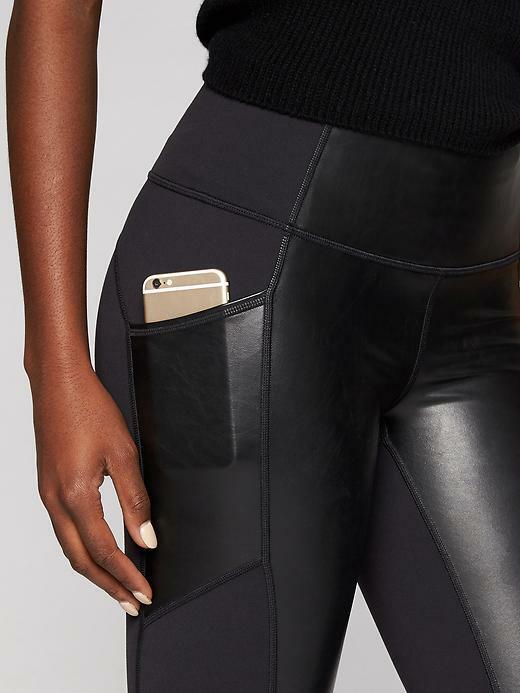 I’ve often looked at faux leather leggings as an enigma – something different, possibly flattering, but daring – perhaps too daring for me? For an adventurous soul at heart, that is hard to admit, but envisioning wearing those shiny pants sure made me feel just a litttttttle bit self conscious. 1//Confidence comes from the inside. I tried them on, just to see how I would actually feel in them *a key test for all important purchases* and I felt fine – still me, but with something more interesting and stylish that felt just like any ol’ regular pair of athleisure black pants/leggings. My gut said, yes! The fashion rule I’m abiding by in my 20s is I can wear anything – as long as I feel great in them. 2// Faux leather leggings ARE fun. They have visual interest but aren’t sequined or so flashy that they would fall out of style. I styled them in a couple of ways so far – as pants with an all-black look to go out to dinner, and under a dress (the one that I wore on the Loft.com feature!) to make them daytime-appropriate for a lunch event. There are those pieces that you can wear (accessories, or clothing items, or shoes) that just pull an outfit together. This is one such item. 3// They fit my cozy chic, practical standard = winner. PRO SHOPPING TIP: If you shop online…sign up for EBATES. Tags: Athleisure, athleta, cold weather style, confidence, fashion trends, faux leather, faux leather leggings, winter style. Bookmark the permalink. They look super good on you! I’m not really that confident wearing ones, but you are killing it! I totally understand! That WAS me, but I got to this stage where I don’t really care or I want to practice not caring about what other people may think of my outfits. Some will be hits, some won’t but I’m committing to keeping my style fresh and comfortable. My rec: Try layering a dress or long vest on top. You will see that cool girl style, but not in your face, you know? 😊thanks for commenting!! Yay! 😘have fun with it.